While the Internet has expanded the opportunities for merchants to sell abroad, it's also created increased opportunities for merchants to localize their efforts. As merchants angle themselves to take advantage of local search’s Bing has rolled out a new feature on its search engine results pages (SERPs) “Fact Answers”. The new feature, similar to Google’s Knowledge Graph, enables merchants to deliver localized results at the top of Bing SERPs. 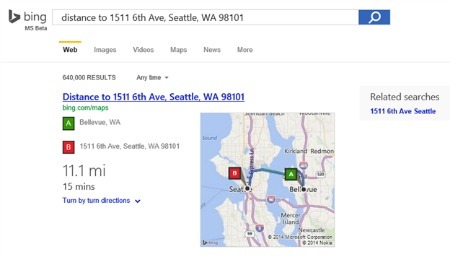 Now when users enter in the name of a restaurant or store Bing will return a local brick-and-mortar address. Also, users can search for the distance between two locations, for a brick-and-mortar store’s hours of operation as well as phone number and receive the results in the Fact Answers section. Bing's Fact Answers is also available on the search engines mobile site.